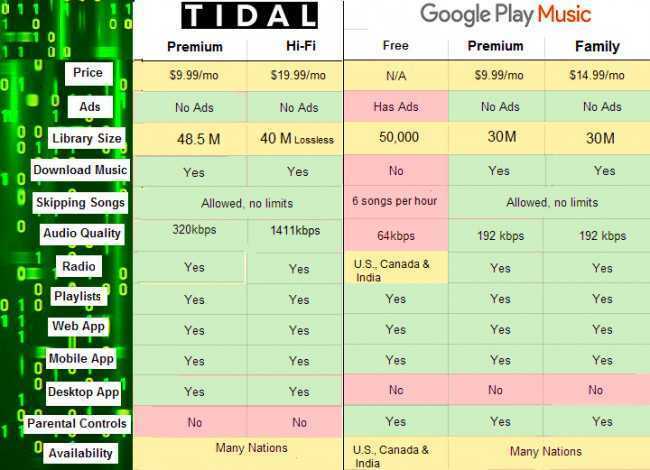 Google Play Music vs Tidal, What Should You Choose? Online Music Store Tidal vs Google Play Music, What Should You Choose? When it comes to music streaming services, a few apps have an epic battle to offer the best to users. Each has features that set it apart from the other. Looking at Google Play and Tidal, it’s no surprise that they are in the same business but differ in-app features, pricing, app design, and software among others. Compatibility and availability vary between the two as well as how much each is popular. Launched in 2011, Google Play Music has over 500 million downloads while Tidal began in 2015 with over 500,000 downloads. Google Play Music does not come with a software client, but it’s application is much flexible compared to the other music streaming services. Doing everything with Google Chrome browser is cool, but not everyone wants to use a browser tab for a music player or accidentally close the tab, turning the music off. Tidal’s desktop app, however, is refined and uncluttered but occasionally has some glitches that include failure to play specific songs or has errors. With an Android material design, Google Play is easy to use since majorities are familiar with Androids. It’s color scheme is light and clean, but Google does not give you the option to choose a color scheme you desire. It has some automatically generated playlists once you open the app and Google play can find your music that you want pretty quickly. Tidal, on the other hand, comes with a darker color scheme of black and gray which contrast perfectly together. Though they use some of the elements found in Google’s material design, Tidal keeps their unique flavor. Where Google Play is easy to use, Tidal is quite the opposite unless you are a fun of modern hip-hop. And listening to music on Tidal often will not guarantee you a playlist of your choosing, Tidal has a mind of it’s own. Google Play comes with robust features with its huge catalog being first on the list. From old school to modern music, Google Play has no shortage of music as well as artist that aren’t known all over the world. Every artist or song your search, you will find with Google Play music. For every music you listen to and happens to have a YouTube video, there is an option for you to watch the music video. With Chrome cast, you can play your music on your television and if you have YouTube or any other music streaming service, even better. All you need to do is open the video on YouTube app and cast it to other non-Chrome cast devices, courtesy of Google Play. Also, you can upload 50,000 songs from your music and filter explicit results from radio station without a premium subscription with Google Play. On the other hand, Tidal offers HiFi lossless audio quality as it’s biggest feature which is noticeable when you use a higher quality speaker system. However, it’s hard to find what you are looking for with Tidal if you misspell and that is unfortunate for bands with names that have unique spelling, unlike Google that corrects and searches. With a free 30-day trial, Google Play Music has both paid and free version. For $9.99 per month, you watch music videos for a lot of songs and albums. The subscription offers offline play, no ads, and unlimited skips. The free version comes with unlimited ad-supported music streaming with Chrome cast support included. Tidal does not have free streaming, but a 30-day trial is available followed by two pricing tiers. The standard tier goes for $9.99 a month but an addition of $10 per month will get you Tidal’s HiFi streaming. A 50% discount is offered to U.S students at accredited colleges or universities making it more affordable. For family discounts, additional accounts attract a 50% reduction, unlike Google Play. Tidal with a limited catalog does not stand a chance to battle with Google Play Music. It has a long way to go as far as popularity and the size of the record are concerned. It is one of the most expensive streaming services with a built-in audio search on the mobile app. Google Play app offers no way to start up in one’s library which is very disappointing, but one can do so in the desktop Chrome app or the Android app. These are just the noticeable differences between the two; as they continue to grow; their unique features will increase as well. Of the two, Google Play is recommended for those who love music from way back to the 90’s while Tidal streams modern hip-hop. In addition, Google is accessible all over the world which means it’s apps are available in most continents compared to Tidal. When it comes to the sound quality, both of them qualify but Tidal rocks when it comes to listening to music using high definition music systems.